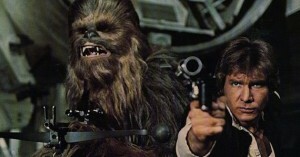 Harrison Ford and Peter Mayhew as Han Solo and Chewbacca in “Star Wars: Episode IV A New Hope”. After 31 years, fans have their first glimpse of Harrison Ford and Peter Mayhew returning to the roles of Han Solo and Chewbacca in the second trailer for Star Wars: Episode VII The Force Awakens, which has been marketed as simply Star Wars: The Force Awakens. The film also features the return of Mark Hamill as Luke Skywalker, Carrie Fisher as Princess Leia Organa, Anthony Daniels as C-3PO and Kenny Baker as R2-D2. Warwick Davis, a cast member in the previous films will return in an unknown role as well. The film is the first Disney Star Wars film release and the start of the sequel trilogy of the Star Wars saga after six other films in the franchise, not including various spin-offs. It sees the introduction of a new trio of heroes including John Boyega as Finn, Daisy Ridley as Rey and Oscar Isaac as Poe Dameron. A glimpse of Kylo Ren in “Star Wars: Episode VII The Force Awakens”. Set to be released on December 18, 2015, the film is directed by J. J. Abrams and written by Lawrence Kasdan and Abrams. The second teaser trailer has 51,180,000+ views at the time this article was published after having been released on April 16, 2015. It features glimpses at the previously mentioned Han Solo and Chewbacca as well as the three heroes, Stormtroopers in new armor, a look at the villain Kylo Ren and Jakku, a new planet to the franchise, which will also be featured in the upcoming Star Wars: Battlefront video game. Comments for Second “Star Wars: Episode VII The Force Awakens” Teaser Trailer Features the Return of Han Solo and Chewbacca are now closed.